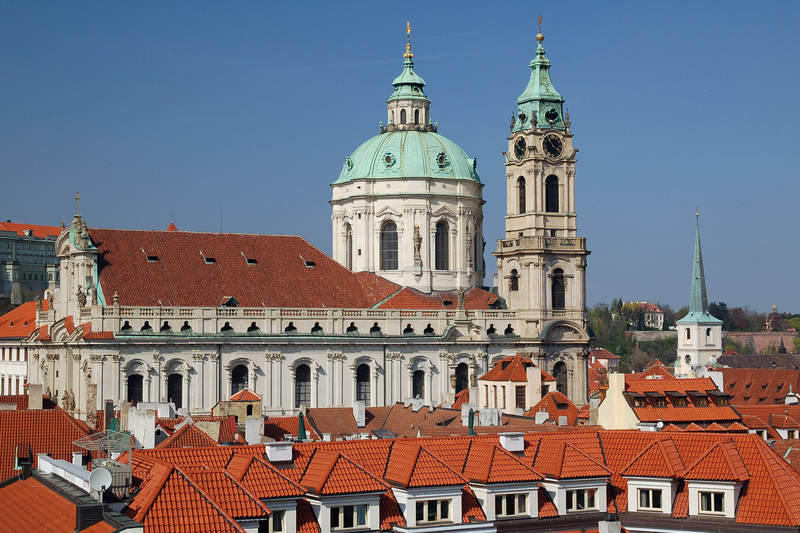 The most famous Baroque church in Prague is also one of the most valuable Baroque buildings north of the Alps. 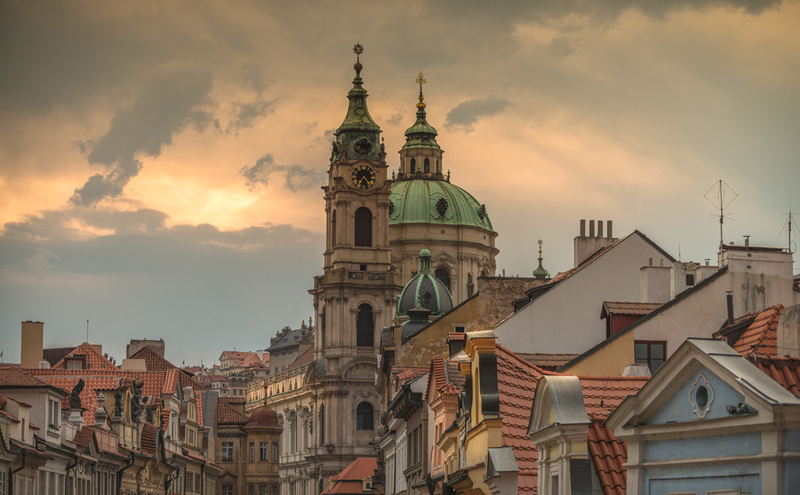 The dome has an impressive diameter of 20 m, and the interior height to the top of the lantern is over 49 m, making it the highest interior in Prague. It is also an outstanding example of high Baroque decoration. Concerts are held in the church year-round on the historic organ dating to the 18th century. Last entrance 15 minutes before the closing time. from April to October daily except Tuesday from 18.00, Christmas concerts from 17.00 (on selected days only). Concerts last 60 minutes. There used to be a Gothic parish church of St. Nicholas at Malostranské náměstí Square consecrated in 1283. This church was handed over to the Jesuits after 1620 within the framework of re-Catholicization due to Albrecht of Valdštejn, and the parish was transferred to the neighbouring St. Václav’s Church. 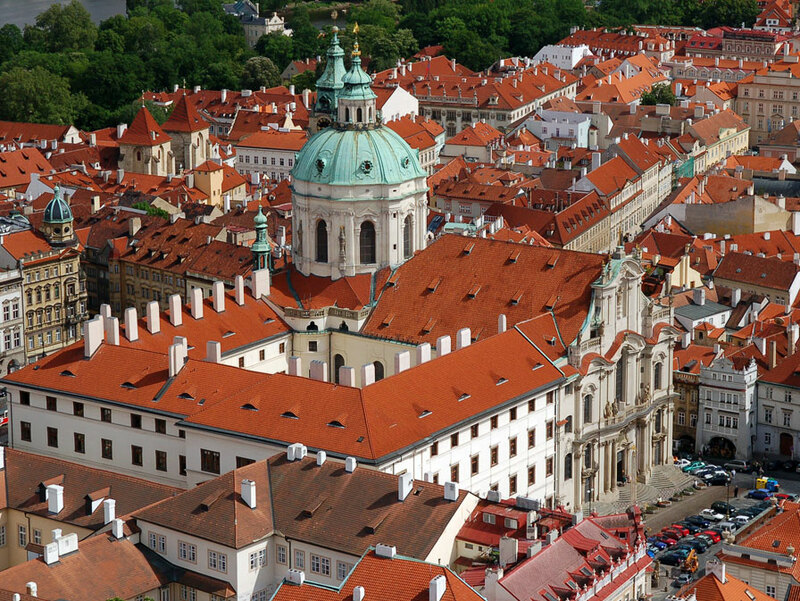 The Jesuits established their first professional house in the parish building at Malá Strana in 1626. 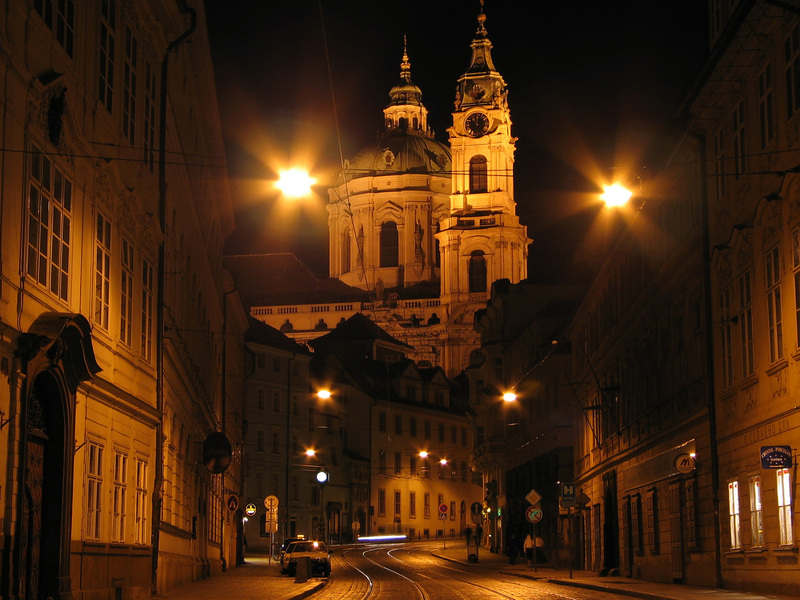 Over the following years, the Jesuits gradually extended their coverage at Malá Strana. Two more years later, they opened a primary school and a junior secondary school. With the support of the Kolowrat family, they planned to build a new church and to build a new professional house, and so they bought out the adjoining land plots - gardens, parishes, schools and 12 houses. The old St. Nicholas church was demolished and in 1673, the foundation stone was festively laid to the construction of the new Jesuit professional house and the new church. The neighbouring St. Václav’s church also stood in the way of the construction, and so it was also demolished and built a bit further away, in the corner of the professional house’s wing. However, the construction of the church according to the original plan of Domenico Orsi kept prolonging, and the construction therefore only began in 1703. The first part of the church was built according to a plan of Kryštof Dientzenhofer. It was the front and the aisle with a wreath of chapels, consecrated in 1711. The dynamic wall of the front has three axes, there is one main entrance and to side entrances with separate semicircular staircases. The church’s interior is very rich architecturally speaking, based on the transmission of geometrical bodies. Builder Kryštof Dientzenhofer died in 1722, and so the remaining part of the temple - the conclusion of the church and the tower, was built by his son Kilián Ignác Dientzenhofer. In 1750, bells were settled in the high tower, and a year later to dome was closed and the construction of the tower got to the top. The temple was consecrated in 1752, but the decoration works kept continuing until the 1760s. 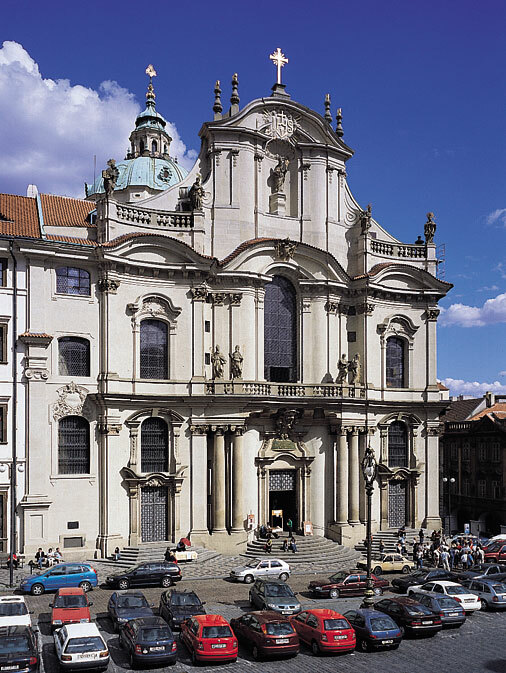 The proportions of the temple with an essential significance for the panoramic view of the Vltava’s left bank are honourable: it is 40 m wide, with an aisle 30 m wide, the length of the temple without the staircase is 60 m, the triumphal arch between the aisle and the choir amounts to 24 m, the foundations reach 14.5 m deep. The dome is 50 m high from the interior and 70 m from the exterior, 79 m with the lantern; the circle under the dome (tambur) has an external perimeter of 20 m, internal of 17 m.
The church’s decorations are purely Baroque. The frescoes were realized by Vienna painter Johann Lucas Kracker, whose style stemmed from Italian late-Renaissance and from Venice contemporaries. The fresco with a theme of St. Nicholas’ apotheosis between the church fathers and the adorants was created in 1760 - 61. The same author also created two altar paintings of Virgin Mary Visitation and St. Joseph’s Death. About 10 years earlier, František Xaver Palko painted much more modern and better quality frescoes, being the second most valued artists of his time after Václav Vavřinec Reiner. His illusive ligth painting represents a row of saints with the Saviour and God Father in heaven. In the side chapel on the right, there is Palko’s hung painting of Death of Francis Xaverius. This is the chapel where the plot of Arbes’ romanetto named Svatý Xaverius (Saint Xaverius). Palko is also the author of the dome fresco. The frescoes were also painted by Palko’s colleagues Josef Hager, Josef Jáchym Redelmayer, and Josef Kramolín. Altogether, there are approximately 3,000 m2 of wall paintings in the church. However, the paintings of Karel Škréta are the most significant part of the decorations: Crucifixion from 1646 in St. Barbara’s Chapel, and Passion cycle of 10 paintings in the church’s gallery from the second half of the 1660s, originally painted for the Jesuit professional house. Other paintings in the chapels were created by Jesuit painter Ignác Raab.